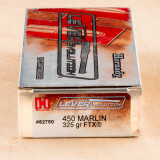 If you use the .450 Marlin cartridge that is more reliable and more effective, order this box from Hornady. You’ll get 20 rounds that deliver outstanding performance to your rifle, allowing you to place long-distance shots with power and precision. 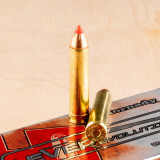 The massive 325-grain bullet uses Hornady’s LEVERevolution design to create a cartridge that is more effective from the rifle to the target. You’ll be hard-pressed to find a cartridge that is as powerful as these .450 Marlin rounds. They come blistering out of the barrel with a speed of 2,225 feet per second, but it’s the muzzle energy of 3,572 foot pounds that makes them truly impressive. 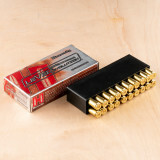 If you use a level action rifle that takes .450 Marlin rounds, order a few boxes of these impressive cartridges. Hornady is one of the top names in the ammunition industry. 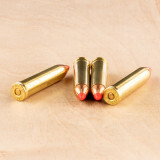 They have reliable cartridges and reloading supplies for rifles, handguns, and more!